The Syrian Civil Defense, a group of volunteer rescue workers that emerged in the liberated areas of Syria, has saved more than 2,500 lives. Khaled hadn’t slept for 48 hours — when, at the site of a barrel bombing in Aleppo, he heard a baby crying. Delirious, he ventured back into the building’s rubble, despite his colleagues claiming that everyone had been accounted for, and there, behind a slab of concrete, was a baby — alive, despite being covered in dust from the concrete building. Khaled is one of 750 members of the Syrian Civil Defense, also known as the White Helmets, a group of volunteer rescue workers that emerged in the liberated areas of Syria after basic infrastructure began crumbling in the chaos of the civil war. The Syria Civil Defense began as a collective of ordinary civilians — once tailors, teachers and construction workers before the uprising began — responding to local bombings, attempting to help in any way that they could. In its early stages, many medical professionals criticized the civil defense teams, pointing out that without medical expertise many of their well-intentioned acts could be causing more harm than good with bombing survivors in critical condition. However, after a preliminary medical and rescue training — and the uniform, including the white helmets that gave them their name — the Syrian Civil Defense returned to their respective neighborhoods equipped to save the first lives. 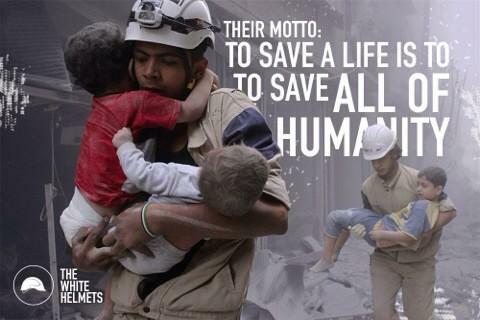 Now, the Syrian Civil Defense has saved more than 2,500 lives with 60 teams across the liberated areas of Syria. Although many of the residents of liberated areas like Aleppo and Idlib have fled, those that remain — often either the poorest and most vulnerable or most dedicated residents — experience daily indiscriminate shelling and aerial bombardments from the Assad regime, destroying neighborhoods and brutally killing and maiming civilians in the process. Despite the risk of a secondary bombing, a common regime tactic, the White Helmets immediately rush to the site of the bombing, moving aside concrete to pick out bodies and rush anyone who might still be alive to the hospital. Political impartiality is central to the White Helmet’s operation. While Syria is riddled with strife between those who support the regime and those who support the opposition in fighting for a free Syria — not to mention the encroaching Islamic State — the White Helmets are blind to these loyalties as they perform their work. Although most of their work comes in the aftermath of Assad’s barrel bombs — which pummel some neighborhoods more than 50 times per day — the rescue workers have also been known to risk sniper fire to help those loyal to the regime. Twenty-six Syrian Civil Defense members have died while working, making it one of the most dangerous jobs in the world with a 5 percent casualty rate. Despite being heralded as heroes by many, the Syrian Civil Defense is vastly underfunded — something that could be easily rectified with international aid from donor countries such as the United States, United Kingdom and the United Arab Emirates. The Syria Campaign is currently gathering signatures to petition these governments to fund the White Helmets in order to purchase supplies and facilitate trainings for new members.